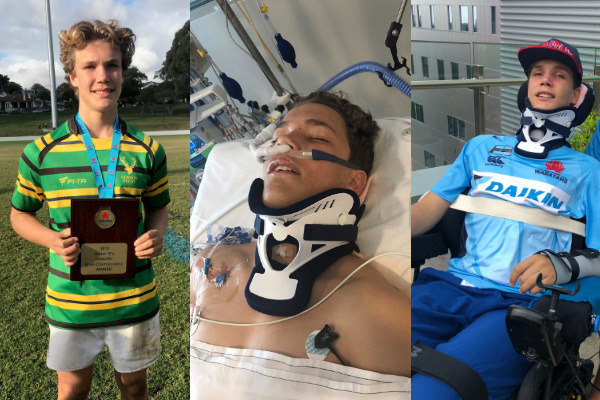 On Sunday the 21st of October 16 year old Alex Noble was doing what he loved best - playing rugby. As a rising sports star he was training with the Under-17 NSW Rugby Sevens youth selection squad. Tragically he was badly injured on the field, breaking his neck and damaging his spinal cord. Rushed to hospital Alex underwent a gruelling 6 hours of surgery where a metal rod and bolts were inserted in his spine and he was placed on a ventilator; and his parents were told that he would never walk again, and to prepare for the distinct possibility that Alex may be a quadriplegic. 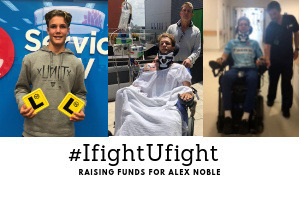 Alex is now able to breathe unassisted, however he has no feeling in his arms or legs and it is now a painstaking waiting game to see how he will fare, over the weeks and months to come, as his body slowly recovers from the surgery and the initial trauma of his accident. Alex may never walk again, but we all hope and pray he will regain the use of his arms, hands and fingers. "I fight, you fight" is Alex's war cry. He has such a positive outlook that we will do nothing BUT flight for Alex and do everything in our power to support him on his uphill battle, every single step of the way. And we ask that you do the same. There are many emotional and financial mountains to overcome and our aim is to raise as much money as we can to assist the Noble family in the days, weeks, month and years ahead to provide and care for Alex. Any donation large or small will assist in helping fight this fight. A trust account has been setup for Alex through his rugby club. Glen Noble (Alex's Father) is overseeing Alex's trust account. The funds will only be used for Alex's rehabilitation and other medical expenses - not for profit.